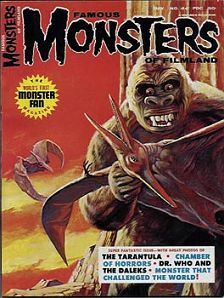 May 1967 issue of FM with nice cover painting of Kong and his pet, Pterri. Issue also has articles on Dr. Who(with Peter Cushing), Tarantula, and more. Nice cover but there are no King Kong articles in this issue. A pic from Tarantula would have been more appropriate. Website design and hosting by Sohodojo Business Services. Item 150 of 466 items displayed in viewer. 0 items in cart.